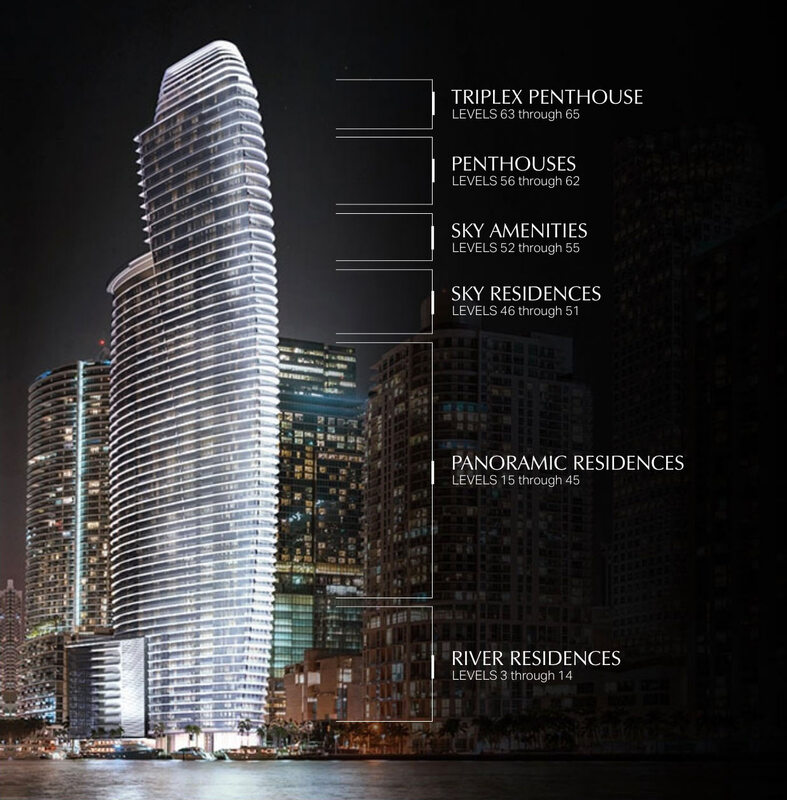 Aston Martin Residences is a luxurious residential tower in Downtown Miami. Construction will begin Fall of 2017 with completion scheduled for 2022. The sail-boat line designed building will consist of 391 condo residences and soar 66 stories high. Spectacular views of the Miami Skyline, Biscayne Bay, Miami River, and the Ocean will delight all residents and visitors. Residences will vary from the largest tri-level penthouse measuring 18,811 square feet to studios of 698 square feet. All penthouses will enjoy private pools and large terraces. Featured in all residences are high-end European appliances and cabinetry, exquisite marble flooring throughout the interior living space, floor to ceiling glass sliding windows and private balconies with glass railings. Top-of-the-line building services include concierge and hospitality inspired services, digital connection to concierge and all amenities from every residence, 24-hour valet and self parking options, electric car charging stations and of course, the building is pet friendly. Aston Martin Residences prices will range from $500,000 to $7,000,000 for conventional units, with penthouses from $14,000,000 to $35,000,000, including the Triplex PH with private pools. Detailed information upon request.